Rudraswamy sits on the porch of his neighbour’s home, on a bright summer day, talking about his life as a farmer. 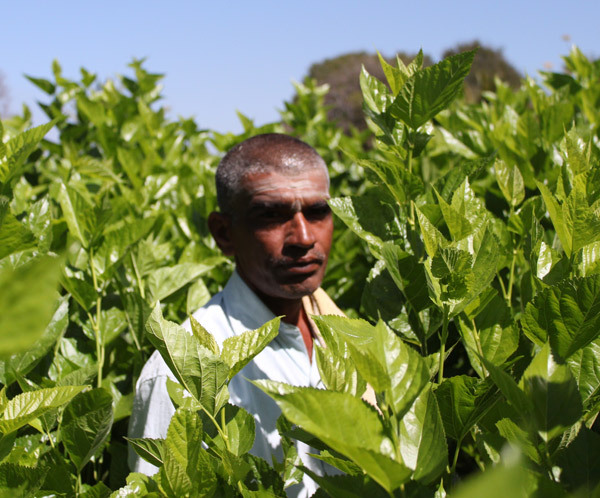 Like more than 50% of India’s labour force, his livelihood is in the agricultural sector. And like more than 70% of the world’s poor, his home is a rural one. The village of Veeraiahanadoddi is a small community of around 40 families, a majority of whom eke out their living in the rolling hillsides of Kanakapura Taluk, Ramanagara District. For them, land is everything. And when that land began to suffer from prolonged use of chemicals, many years ago, Rudraswamy was faced with a great difficulty. “The soil was burnt and the yields kept reducing,” he says. He turned to sustainable agriculture to provide solutions and attended GREEN’s training sessions to change his approach to farming. These new methods were a marriage of traditional knowledge and modern techniques that focused on the ecology of his land. He soon planned to eschew the use of chemicals completely. However, like many of his fellow community members, Rudraswamy was faced with a challenge on his path to becoming a truly organic farmer: as a small scale producer, he could not afford the more traditional forms of certification that would allow him to label and market his produce as organic. And this would ultimately reduce the economic returns of his endeavors. Around the year 2009 GREEN’s intervention programs made him aware of the Participatory Guarantee System, says Rudraswamy. This initiative proved a perfect fit for a farmer like him, since the quality assurance provided by PGS has the potential to increase the economic returns of any surplus produce they may have to sell. It was inexpensive, transparent and based on a peer appraisal system of trust. Rudraswamy decided to enroll for it. “I realized that the certification would provide assurance that my produce was organic and that would increase my earnings. With this increase in income, I could repay my loans and increase savings,” he says. Rudraswamy feels that PGS will give him greater freedom to sell his produce at rates more favorable to him. Under GREEN’s facilitation, Rudraswamy, along with his fellow farmers, joined together to form a peer appraisal group of 20 members and enrolled for PGS. The group then took a pledge to uphold organic farming principles and formed an internal assessment committee of 3 members. This committee was to inspect members’ farms to ensure they met the standards of organic farming as outlined by the PGS Organic India Council. Rudraswamy and his neighbors also attended GREEN’s capacity building sessions to empower themselves towards a more sustainable future, learning about how to prepare organic inputs at home, inspect farms accurately, manage farm resources efficiently etc. As a majority of the members were functionally illiterate, they also appointed a convener from within the group for the main purpose of documentation. PGS has created a platform that enables farmers like Rudraswamy to propagate organic farming principles at a grassroots level. There is a formalized process now and a framework that guides farmers. The camaraderie among the farmers is. Most importantly, the decision to enroll in PGS has given him and his family peace of mind says Rudraswamy. One of the main reasons was that eliminating the use of expensive chemical inputs reduced the financial strain on his meager economic resources. He no longer has to take out loans for cultivation purposes. And soil health on his land has improved significantly. Going beyond the boundaries of his own family, PGS has gradually brought about many changes in Rudraswamy’s community at large. There is a camaraderie between the group of enterprising farmers now that was absent before. are now able to bring about changes to their farming. His phone rings, as he remembers those days of difficulty: a fellow farmer has called up to his advice on preparations of some organic inputs. Rudraswamy’s extensive knowledge makes him somewhat of a go-to person in his community. And this is not just restricted to his village of Veeraiahanadoddi. As a resource person, he disseminates knowledge to farmers from various parts of Ramanagara District. “I have the confidence now to speak to people and share my knowledge,” he says, something which he was not able to do before. -women in the community are employed in the seed conservation activities of the CSB. They are also involved in purification and packing of seeds. Therefore, seed conservation activities increased. PGS certification directly increased the amount of seeds being sold to the market and this increased the seed conservation activities which lead to more women farmers being involved. – Created a platform for women to come forward and discuss their concerns within the community. There is a gender equality in decision making. NGO training helped him become aware of the concept of PGS and its advantages. He became aware that certification would provide proof that his produce was organic, and therefore increase his earnings through the sale of organic produce. With this potential increase in income he also became aware that he would be able to repay his loans and increase his savings. -He is sharing knowledge acquired through training by disseminating it to other farmers in the PGS group as well as in surrounding villages, and is often used as a resource person in this capacity. -through his work as a resource person he gained the confidence to speak to others i.e. personal empowerment after PGS. -trust is important in PGS. -Farmers must be diligent and take their oath to organic farming seriously. And the PGS group must monitor each others’ farms. Some members in his group were discontinued from the certification process, until the farmers met the norms of PGS. -He became aware of the concept of joint marketing after becoming a member of PGS. The family health has improved because there is poison free food. There are no loans to be taken for agricultural practices, so there is peace of mind. Bonds created within the community has increased the social wellbeing of the family i.e. the family receives support from community members, where there was no support before. If he sells to someone individually, he is uncertain of getting returns. But selling through the farmer’s society of Janadhnya, to which his PGS group belongs, he has faith that the he will be able to sell his product. Profit sharing has been introduced. And profit margin has increased. Seeds are sold through the society and profit from sales is shared by PGS groups. The money ensures future sustenance of seeds. Access to credit has improved because mobilization within the community has increased through PGS. Profit sharing through the joint marketing and sales of seeds through Janadhanya has resulted in PGS groups receiving money for the future sustenance of the group. Farmers groups within the community now give loans at just 1% of interest to those in need. Through the PGS has given market linkage. And the profit through the Janadhanya has increased. Economically more stable through PGS. Without seed the future harvests are not possible. It is the most important thing. Everyone can benefit from the management of seeds. Indigenous varieties minimize expenditures. Seed sharing enables in situ conservation and increases the number of farmers conserving indigenous seeds for the future. Without indigenous seeds organic farming is not possible. Very important as traditional knowledge is inherently sustainable. Harmful chemicals are not used in traditional knowledge. Only organic methods are used, whether it be seed storage or cultivation. This sustainable knowledge must be available to future generations so that they may continue with organic practices. It also minimizes expenses.